Meet the GEMSI crew before they leave Egypt! Learn how you can make and organize a hackerspace near your location, or just meet some enthusiast people about the idea, there is already some hackerspaces under construction in Egypt like CairoHackerSpace, so you can also join one! 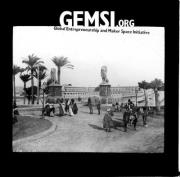 From GEMSI there will be Bilal Ghalib, Mitch Altman, and Adam Funk, and you'll meet also the CairoHackerSpace members. The meetup is next Thursday at FCI - CU, @4:22, be on time! The event on Facebook and more details from here.